We’ve just returned from our second visit to Cornwall, this time to beautiful St. Mawes on the southeastern coast. The weather was very English. That is to say…partly sunny, partly cloudy, and very rainy. Still, we enjoyed a restorative “Cornish” weekend. (Everything in Cornwall comes proudly with the prefix “Cornish.” For example, “Cornish pasty” “Cornish cream tea” and “Cornish sardines”). For the most part, we spent the weekend dazzled by the beautiful Cornish sea views. On Saturday we arranged for a Cornish skipper, Mark, to take us over to the Pandora Inn, in Falmouth. The high speed ride on Mark’s rib with Dash was a Cornish experience we will never forget. It was WINDY! But Dash found her sea legs no probs. 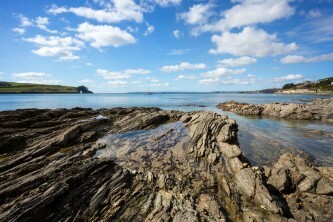 In Falmouth, we completed a pleasant circular walk around Mylor Creek, stopping to take in the Cornish sea air. One hillside cat nap became a perilous encounter with Cornish cows, who seemed to materialize from nowhere and at uncomfortably close range. According to Bill Bryson, cows attack walkers a lot. But…we still like being in fields with cows. Other noteworthy moments on the trip were: lunch at Pandora Inn, multiple pop-ins to the Cornish artist’s gallery, and visiting St. Mawes Castle. St Mawes Castle is said to be Henry VIII’s most picturesque coastal fortress, built to defend against the French. We very much enjoyed walking past the castle and into a quiet, residential area with large homes that gave us the impression of a Cornish Carmel. One interesting tidbit about St Mawes is that homes here come with London price tags, and 85% of them are second homes which remain vacant most of the year. This is sad really. The hotel bartender, Gilbert, a filipino man who has lived in St. Mawes for 15 years, says it’s a ghost town in winter. Speaking of the hotel staff, we really liked them and they seemed to genuinely like working there. We were amused by how accident prone some of them became in our presence. Also amusing was how eagerly they would remind us of the Dogs’ Bar. The Dogs’ Bar is a dog-friendly dining area on the ground floor. It was nice, especially when they lit the fire for us, but our first choice was to enjoy the sea views. They must have thought us crazy for choosing to have most of our meals on the terrace, under heat lamps and wrapped in Cornish wool blankets. The highlight of the weekend was on Monday before we left, when we went back to walk the National Trust property past St. Mawes Castle. We stumbled upon a little Cornish beach where Dash found her inner dog and bravely set paw into the cold Cornish sea. It was a delight to watch her transformation into Michael Phelps. Cornish seafood, Cornish air, Cornish views, Cornish hospitality. It was just the weekend we were hoping for. We didn’t want to leave!